Some people are known to wear their hearts on their sleeve. Brandon Jones is known to wear his life’s mission on his forearm – literally. Two verses from the 82nd Psalm are tattooed on Brandon’s arm and speak to his commitment to be a servant and protector of those in need. It’s both ironic and poignant, given that Brandon has found himself in great need more than once. Brandon joined the EMSA team as an EMT in 2009. He started Paramedic school in 2010, but battled alcohol abuse, financial crises, and ultimately, homelessness. With support from his EMSA family, Brandon got back on his feet, stopped drinking, and graduated. Brandon experienced a relapse after responding to an apartment fire that killed two children. Then, while working to maintain good health, Brandon suffered a devastating injury that took him off the ambulance. 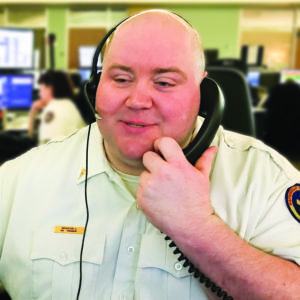 Brandon was offered a position as an Emergency Medical Dispatcher in 2014 and has since flourished, personally, and professionally. Brandon is renowned for making quick, strategic decisions, and for championing the interests of patients and field crews alike.